Tomboy to the core, Toni Valentine understands guys. She'll take horror movies, monster hunts and burping contests over manicures. So Toni is horrified when she's sent to the Winston Academy for Girls, where she has to wear a skirt and learn to be a "lady" while the guys move on without her. Then Toni meets Emma Elizabeth, a girl at school with boy troubles, and she volunteers one of her friends as a pretend date. Word spreads of Toni s connections with boys, and she discovers that her new wealthy female classmates will pay big money for fake dates. Looking for a way to connect her old best friends with her new life at school, Toni and Emma start up Toni Valentine s Rent-A-Gent Service. But the business meets a scandal when Toni falls for one of her friends--the same guy who happens to be the most sought-after date. With everything she's built on the line, Toni has to decide if she wants to save the business and her old life, or let go of being one of the guys for a chance at love." When a small prank goes wrong it lands our MC Toni ‘McRib’ Valentine in an all-girls school, she believes everything is about to change with her small group of friends – all boys, she tries everything to keep them together but their dynamic is changing and her friends are moving on. Toni was a sweet character but came across as a little immature, she was seventeen and holding on to her childhood, I felt the book came across as quite juvenile; the silly prank, believing in a lake monster and then her ‘business’ of setting up her friends with girls from her school to make some money and bring them together unfortunately didn’t work for me. I did enjoy seeing Toni mature throughout the book and learn to accept change. I wasn’t sold on Toni’s Rent-A-Gent service; it was a little far-fetched and as you can imagine didn’t come without dramas; her plan to connect her best friends with her new life at school wasn’t the most solid plan but at least a new friend – a girl named Emma came from it. The secondary cast - Ollie (Luke), Cowboy (Justin) and Loch (Micah) were each interesting, I liked reading about their childhood and their close knit bond, the friendship aspect was done well. The romance wasn’t at the forefront of the story and was slow to build and really cute. 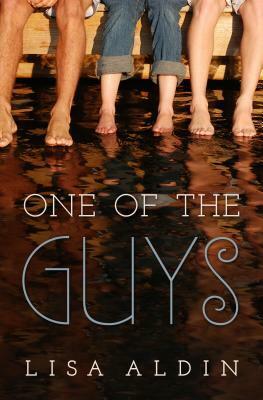 Overall, One of the Guys is written well and is an enjoyable coming of age story, I feel it would be suited to the younger YA audience. Thank you to Spencer Hill Press via Netgalley for the opportunity to read and review One of the Guys. Apparently I'm not the only one who's striking out book-wise in early 2015. At least I'm in good company! From the sounds of it, the secondary characters were the best part of the story which isn't saying much given that you had issues with the protagonist, and the overall premise. I hope you have a wonderful weekend, Sharon, and hopefully a better novel to go with it. I haven't had much luck at all this year Carmel! the secondary characters in this were great but otherwise this one was a miss for me unfortunately. Hopefully our next reads are good ones Carmel! Have a great weekend. I am curious to hear your thoughts on this if you get a chance to read it Nereyda, th MC came off as very immature despite being 17 (I think). Sometimes these books flutter between MG and YA, and it looks like that may be the case her. The fact that the plot seemed far-fetched makes me the most apprehensive. This one felt more like an MG read, it came across as juvenile because of the MC unfortunately. I was actually thinking about getting this one. I think I will pass. Thanks for the honest review.